A series of unexplained deaths in foreign hospitals sends an idealistic UCLA medical student on a desperate search for answers, in this chilling tale from the master of the medical thriller. Jennifer Hernandez is a fourth-year medical student at UCLA, just completing an elective in general surgery, whose world is shattered during a break in an otherwise ordinary day. While relaxing in the surgical lounge of L.A.'s Cedars-Sinai Medical Center, she half-listens to a piece on medical tourism, where first-world citizens travel to third-world countries for surgery. But when she hears her beloved grandmother's name mentioned, her own heart nearly stops: the CNN reporter says Maria Suarez-Hernandez had died, a day after undergoing a hip replacement in New Delhi's Queen Victoria Hospital. Maria had raised Jennifer and her brothers from infancy, and their bond was unshakable. Still, the news that Maria had traveled to India was a shock to Jennifer, until she realized that it was the only viable option for the hardworking yet uninsured woman. Devastated, and desperate for answers, Jennifer takes emergency leave from school and heads to India, where relations with local officials go from sympathetic to sour as she presses for more information. With the discovery of other unexplained deaths followed by hasty cremations, Jennifer reaches out to her mentor, New York City medical examiner Dr. Laurie Montgomery, who has her own deep connection to Maria. Laurie, along with her husband, Dr. Jack Stapleton, rushes to the younger woman's side, discovering a sophisticated medical facility with little margin for error. As the death count grows, so do the questions, leading Laurie and Jennifer to unveil a sinister, multilayered conspiracy of global proportions. 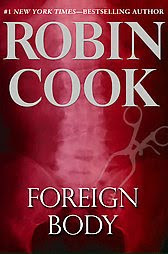 It's been a while since I read a Robin Cook novel so I was excited to find Foreign Body on the bargain rack at Barnes and Noble. If you've never read a medical thriller, Robin Cook or Michael Palmer are both excellent authors with very gripping plot lines. I like medical thrillers as much as my legal/murder mysteries. I like the variation they provide---each novel deals with a different medical issue so that mixes things up a bit. Foreign Body does not disappoint. It is exciting and fast-paced. Each chapter occurs in a differnent location with different characters, so I felt like I was watching an episode of 24 for the entire book. This is not a bad feeling---I love 24! The way the chapters jump around, I kept picturing events happening on a split-screen (like in 24) and was left wondering when Jack Bauer was going to show up with guns blazing and save the day. I have to say that I was surprised at the ending. It seemed a little pat to me. However, the story is definitely engaging, albeit somewhat predictable. I have trouble with predicting what's going to happen in books and then being proved right. It's probably because I've read so many books in my lifetime that I'm experienced in divining plots. It's rare that I'm truly shocked by a plot---but I love to be surprised! The Indian names got pretty confusing. There are so many Indian characters in the book that I had some difficulty keeping them all straight. This probably would have been less problematic if I had read this book in one sitting; however, I read it over the course of four days while reading another book at the same time. I like how Robin Cook pulls you in to the story right from the beginning. I also like how his novels are based on current issues in the medical field. It makes me feel like I'm watching a really exciting episode of Dateline. No. There's murder and child abuse (no details, but there are multiple mentions of it) in this one. Great review !! I haven't read a Robin Cook in quite a while. I will be putting this on my ever growing tbr bucket list. Thanks for the review. Oh, thank you! It was a really good read. It moved quickly. I really enjoy Robin Cook. He's reliable and I love that. I agree with the crazy names but other than that it was a great book. I LOVE THIS BLOG!!!!! Thank you so much! Natalie and I really appreciate it! Never understood why these particular "bad guys" wanted medical tourism to fail in India. Exciting, very good descriptions of Dehli, good characters, lots of medical jargon but descriptions made them tolerable and understandable. Good read. It was exciting through out. lots of medical drama and it had many twists and turns. I would highly recommend this book.